I like to roast my own red bell pepper for this dish, but if you are in a hurry you may substitute the ones that come in a jar, rinsed and patted dry. If you prefer, substitute Fresh Ricotta Cheese for the Parmesan, using a small spoon to dollop on small amounts of cheese just before serving. 1. To prepare the red bell pepper, place the pepper in the broiler or over an open gas flame. Using tongs, turn the pepper frequently until the skin begins to blacken on all sides. Place the pepper in a covered bowl or zip top bag and let rest for 10 minutes. The skin should easily peel off. Seed the pepper and cut into strips. Set aside. 2. Bring a large pot of generously salted water to a boil. Add the pasta, return to a gentle boil, and cook 8 minutes. 4. In a large skillet over medium heat, cook the onion in the oil for 5 minutes, or until beginning to soften. 5. Add the zucchini, quartered tomatoes, and pepper and cook for another 3 minutes, stirring occasionally. Season with salt to taste. 6. 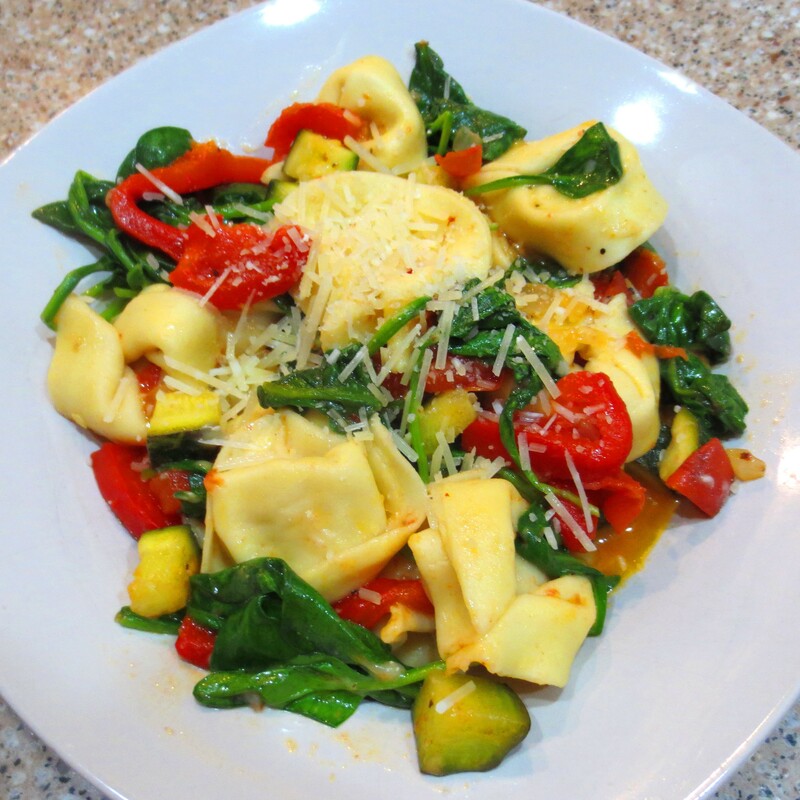 Add the red bell pepper and baby spinach, then drain the pasta and add to the skillet. Toss to slightly wilt the spinach. 7. Sprinkle on most of the Parmesan cheese, reserving a little to top each serving, and serve immediately.